Sweden is often described as a sort of actually existing capitalist utopia: supposedly equal, progressive, environmental and feminist. In this text, we will show how Swedish society is hardly something to emulate even as we ask what it means to fight in (supposed) welfare capitalism. We will do this through an explanation of our projects and theories in relation to current struggles in Sweden. As we believe this to be the most fruitful way to explain our situation. We who write this are a small group from the university city Lund, close to Malmö, called Autonom Organisering. We work with issues around feminism, class struggle, theory work and more. We put a great deal of emphasis on our internationalist work as we try to learn and develop a movement beyond and against borders and nation states. 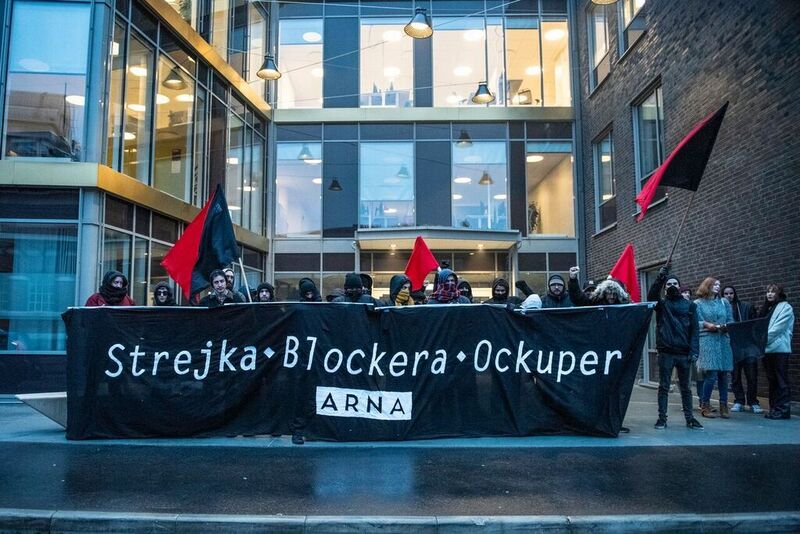 We are organized with comrades in Finland, Denmark, Norway and the rest of Sweden within the Autonomous Revolutionary Nordic Alliance (ARNA), which was formed in anticipation of the G20 meeting in Hamburg in 2017. We are inspired by the experience of autonomia in Italy and the struggle to create communism through proletarian autonomy and self-activity. It should be noted that the word „autonomous“ does not carry the same exact meaning as it does in Germany. For most comrades in the extraparliamentary left in Sweden it is merely self-descriptive. The idea of being „post-autonomous“ as opposed to autonomous does not quite exist in the discourse of the radical left in Sweden. Right now, we believe the situation in Sweden to be calm on the surface, but there are very important developments going on beneath this surface. The recent election is one symbol of this change, where once there were two clear blocks – one left-wing and one right-wing – now the advent of the fascist Sweden Democrats taking 17% means that no block can form a clear parliamentary majority. Instead, a government composed by Social Democrats and Greens supported by two liberal parties has been formed for the first time in decades, a supposedly ‚antifascist‘ government, in the sense that it doesn’t give influence to the Sweden Democrats. The program of this new government is clearly neoliberal – with immense cuts to the already damaged welfare system, the protection of the environment, continued racist policies towards migrants. The Social Democrats were the engineers of this new government, selling their election promises of welfare initiatives in order to stay in power. For all intents and purposes, the Social Democrats have been the creators of the modern Swedish state, governing for 59 years out of 68 years in the period 1932 – 2000. This means that they are one of our major enemies, and to understand what Social Democracy and reformism is paramount in order to be able to articulate a political break that will allow us to forge a revolutionary road ahead and to truly create a better society and not merely create a slightly better capitalism. For these reasons, this text focuses on Social Democracy in relation to class, capital, state and gender. In order to understand where we are, we have to look at what has transpired before. We wrote a text called “En gnistrande väv – arbetsplatsreportage från det kämpade 60/-70-talet” which translates to “A sparkling weave – workplace reports in the struggling 60’s and 70’s” (albeit the English translation hides the reference to a famous song in the leftist ‘progg’/folk tradition) where we re-published forgotten workplace reports written by leftist intellectuals thirty and forty years ago. These reports were all made during the heyday of Social Democracy. Wages were rising, there was full employment (defined as 2% or below), the government launched the “million project” where one million flats and houses were built. Olof Palme, the famous Prime Minister, denounced the Vietnam War. This is connected to the overall Fordist regime of accumulation that was hegemonic in all of the global north at the time, including both the aforementioned status of labor, but also the import of foreign labor and the racist division between these foreign workers and native ones and the nuclear family as a unit of consumption and with this the gendered work of women inside and outside the family. The reports are full of quotes like these that show the continued drudgery of wage slavery. Altough their materialistic conditions improved, something remained missing. Dignity, meaning and other almost existential questions keep reappearing in the reports. How can you live a good life as a worker? Even in „the most equal society ever created“, in the Swedish 70’s, these issues remained because the basic categories of capitalism remained. At the time the Social Democrats controlled a huge labor machinery. 20.000 elected workplace ombud and paid ombudsman reported to the party. They fought communists, anarcho-syndicalists and other radical workers by allying with the employers, formed their own secret police (! ), attempted to break the wave of wildcat strikes that spurred the rebellion at the time (from less than 20 wildcat strikes in the years prior to 68, to 250 a year up until 1975 or so). The unions had long before been turned into extremely centralized bureaucratic entities where the holding of a Social Democratic membership card was a necessity to be able to rise in the ranks (which it still is). However, at this time there was still some activity among rank and file members in the unions which both mobilized for the Social Democrats and also forced them to engage with proletarian issues. It is clear that the Social Democrats at the time never attempted to create another society, but merely improved national capitalism. The specific forms in which capitalism exists in Sweden and the other Nordic countries is thus one where the class dictatorship relies upon parts of the labor movement to discipline its members. We can only understand the welfare state if we understand that every reform was an attempt by the Social Democrat-led state to recuperate proletarian struggles. The Fordist mode of production gave way to postfordism later in Sweden than elsewhere, but by the late 80’s the welfare state was transforming into something unrecognizable to earlier generations. In the early 90’s an economic crisis, a right-wing government and austerity essentially destroyed the basis of welfare. The basis for past reformism is now long gone. There is no real growth in Sweden just like in the rest of the global north after factories moved away to protect the profits of capitalists. Thus, there is no space for taxation and due to neoliberal policies there is no more full employment. Individuals thus become long-term “burdens” on the state due to no fault of their own. If Social Democracy was capable of using both repression and reform in order to recuperate social movements in the past, it has lost this ability. This is both due to the ideology of neoliberalism but also because of actual changes in the material circumstances. In Sweden, there has always been a multitude of leftists who believe that we can somehow return back to the glory days of 1972 (even if this 1972 only exists in their imagination). We can’t. This moment in time is over. Modern capitalism cannot be reformed in the same way as in Fordism. Today, the class is a fractured multitude of different groups of workers: white female nurses, racialized young unemployed men, precarious urban youth, racialized young unemployed women, factory workers, etc, etc. There is no one dominating segment in the class. Just like with endless seasons of the Walking Dead, Social Democracy refuses to understand that it would be better if it died. Circa a year ago, the Social Democrats proposed a limitation to the right to strike, attacking the few independent unions that are not under their control. Particularly, they aim for the Swedish Dock Workers Union which organized the majority of dockers in Sweden. One of the most interesting developments in Strike Back is the development of the few remaining union activists rebelling against their leadership. Our hope is that this will, in the end, mean an ultimate break with the centralist model and their ties to Social Democracy, and every week there appear to be new developments to that end. For example, the union leadership has lately hinted that their relation to the Social Democrats must be re-evaluated, and have come closer to courting the Left Party (the Swedish ‚die Linke‘). Some people in the left-wing in Sweden believe that what is lacking is consciousness. This is not our experience. Many people in workplaces and in society at large are aware of the situation. What they lack is hope and power. Hope is connected to two things: one is the belief that our struggles can actually win and achieve something, and one is a larger vision of another society. Our self-confidence as well as the belief that we can actually is win, is badly damaged after experiencing thirty years of lost struggles and repression. The welfare state has been dismantled, in the last decade we have seen the Sweden Democrats transform from a tiny neo-Nazi party into a true power player. At the same time there are hopeful struggles in Sweden, particularly the feminist struggle. There have been several successful pushes for feminism over the last decades and feminist ideas are now hegemonic in society. Young people are, according to polls and our experiences, incredibly engaged on a broad scale in all strata of society and there have been fruitful developments for transgender people and laws for sexual consent. This is not to say that violence towards women, homophobic and transphobic attacks do not occur but rather that we have won the struggle for hegemony (for now). This struggle was a fight carried out by the women’s movement and the labor movement, with a particular emphasis on autonomous feminists from the 90’s. However, we must then ask ourselves: what does it mean to win? Feminism has now become a hip topic that is depoliticized and recuperated by the state. Many of us have jobs where we do feminism or promote equality, LGBTQIA-rights and so on as part of our tasks, but we all realize how limited, liberal and dangerous this can be. We have to strategize better on the topic of what we do when we win, because we can find ourselves just as defeated in victory as we would be in failure. The feminist struggle is hopeful, but it isn’t spilling over to other topics because we have been unable to rearticulate this as our victory and because other struggles are structured in different ways. In Fordism the labor movement, and the proletarians who believed in socialism, had a vision of society that was more or less based on the factory. From anarcho-syndicalism to Stalinism the factory was the model upon which we would base our society. It would certainly be creating nice things rather than weapons of war, and it would perhaps be less polluting, the red flag would be raised from the rooftop and the workers (equal part men and women) would go to work with a smile. But now, in postfordism, this dream is gone. As one of the theory groups close to us, Motarbetaren, stated: what proletarian dreams of controlling McDonalds? Who wants to build a soviet in a call center? The sociomaterial changes in society has undermined socialism as a vision. Thus, we believe that we need another utopia, fit for the 21st century. In this, we are inspired by the 2016 congress on technology we attended, hosted by the “…ums Ganze!” alliance. This congress raised the question on how to consider a communism in this modern, digitalized, automated society that we live in, a society that is about to die due to pollution, a society where some are overworked and exploited by apps and digital control and others are made redundant by robots, a society where logistical chains extend across the world which undermines the workers power. Sweden, for example, is one of the world’s most digitalized societies where paying in cash is already today far from the norm. We have tried to continue this discussion in a study project we call ‚Red Mirror‘ which has since spread to Stockholm where we attempt to engage with these issues. 1) Such a view tends to perpetuate the subject-object distinction of most leftist groups, that is to say: we are the vanguard and you are unenlightened proles who we must save. This way of viewing class is reactionary, and tends to create these bizarre, masculinized, manipulative micropoliticians that populate strange little Trotskyite groups. The operaist tradition developed out of the idea that workers have knowledge, and often deeper knowledge than self-professed experts, and part of our practice is to try and learn from and develop knowledge in concert with others. 2) People change from experiences, and though reading and writing and discussing can certainly be experiences, mass changes in class consciousness does not come through reading leftist webpages but by participating in action that reveals the power structures to be. Our problem, then, is not a problem of consciousness but a problem of power. There are no more large-scale strikes, and particularly in Sweden there are now a record-low level of striking (and the free unions who do strike are targeted by the new strike law to inhibit even this). This is due to the change in class composition in postfordism where we work in smaller workplaces that are more spread out, connected to one another by long logistical chains. In past socialist thought, from Marx and Engels to Rosa Luxemburg and others, the strike is both a show of force for the proletariat as well as a school for action. It is where you weed out backstabbers, teach people who their enemy is and createclass consciousness. Thus, without the strike being viable for this, we have to look at other alternatives. The only one we can see that exists is the mass action which can fill the role of large-scale pedagogy and capacity to create power. In Germany, the radical left has power in it’s capacity for militancy and resistance. In the Nordic countries, we have it to a lesser degree but we still have it. We are always impressed by the seriousness and capacity of these mass interventions in Germany. The latest example of this is the mass radicalization which has occured in the otherwise individualistic and lethargic Swedish environmental movement that is now changing to a more interventionist and collective approach after a few years of participating in Ende Gelände. The right-wing is always more capable than the left of seizing and using power, because it does not worry so much over what will occur the next day. It has a longer plan. The right invaded Iraq, even as millions took to the streets, they destroyed the Swedish welfare state even as tens of thousands protested through the years against it. Now, these things are fait accompli. The right changed the world, and it changed the ideas around the welfare state and Iraq. We, of course, will not invade a nation and kill millions, but we must be more strategical in seizing and using the power we do have. Particularly, our power is in disrupting the logistics of capitalism. We are again inspired by “…ums Ganze!” and were part of blockading the harbor in the G20 summit in Hamburg 2017, which we believed to be a very promising action. Logistics is today the lifeblood of this modern, postfordist, digital capitalism that we have described in this text and is incredibly weak and easy to blockade. As a sidenote, many of our German comrades appear perplexed when we discuss this line and feel that the mass actions do not truly create something new in this sense. After discussing this extensively we believe that a large difference is that the German movement has such widespread infrastructure. It is possible to live in a Hausprojekt, to go to a people’s kitchen every day, to only drink in movement bars and to occasionally go on an adventure by bringing your flatmates and going on a bus to some city and do action for a day and then go home… This is not possible in Sweden. Those who do participate in mass actions tend to become changed, they develop a new attitude to life and struggle and tend to take this to creating and participating in local struggles. Thus, the old critique against campaigning that mass actions and campaigning don’t really change anything but serve as a distraction to real struggles does not at all appear to speak to our situation. Rather, we find a clear dialectic between the everyday and the big action. In this text we have argued that classical Social Democracy in the form of the „Nordic model“ is a pipedream and one that is also practically impossible to return to due to changes in capitalism. We have traced the development of postfordist capitalism and it’s relation to modern technologies and shown how these have changed the capacity for political action. In this, we have particularly focused on what we need in terms of power and in terms of a clear vision for future communism. We would like to end with saying that the role of communists is to construct the universal through the particular, to unite the different segments of our class. This does not mean to merely state that we all have the same interests, an action that risks denying the particular needs of women, racialized groups, trans people and so on. Rather, it is practical work which changes depending on the context. Our work with the strike law in Sweden and our struggle against Social Democracy is an attempt to break apart the class dictatorship that the Social Democracts are the architects of. We hope that we have been able to communicate something that is of use for our comrades abroad.